I thought I would share some snippets of my Mom’s townhouse. 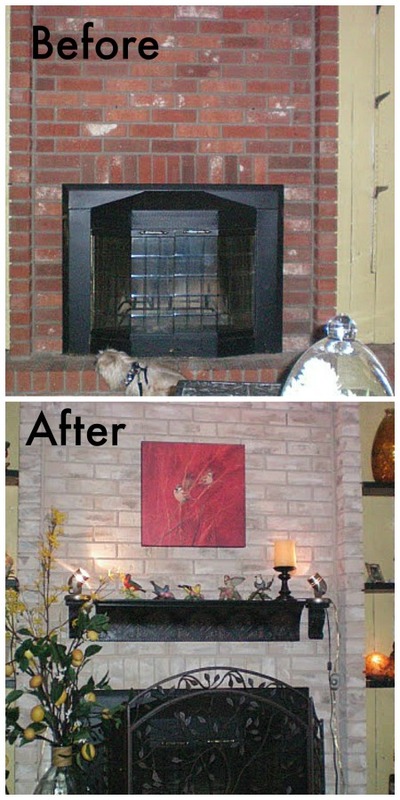 One thing she did to lighten and brighten her space was have her Brick fireplace painted. Actually, her and my Step-Dad did it themselves. I recently shared my Mom’s townhouse gardens. She also has a fairy garden that is just adorable. This is an old post, so pardon the pictures. I remembered I posted this over 3 years ago and felt it to be a good post to refresh for those not only in need of a FP makeover, but who also enjoy down sized living. She downsized around 5 years ago, and it was the best thing she could have done. Although, she misses all her property, sprawling gardens, and space, she has adjusted well. Her place is so charming,cozy, and home sweet home. Here are the deets on the Brick fireplace painted. It was originally dark brick, and she hated it. She used a kit called Brick Anew. She said it was so very easy to do. This of course is the before. It really darkened the space, and brought the ceilings down. It really did lighten and brighten the space. Did I mention she loves birds? Oh yes indeed she does. Notice how she did not have a mantel? Clever idea to purchase a tin shelf and place above the FP to give the appearance of a mantel. As you can see, she has filled every nook and cranny in her space. She has been inspired by blogs too, as you can see she found these wooden boxes that many of you have as well. She also loves Chalk paint! She did a great job on this piece. I love her kitchen window treatment. So charming. Guest room, and I will say it is so very cozy! Thanks for stopping over today. If you are not a regular I would love to have ya back! Plenty more to look at it. What kind and color of paint did she use on the fireplace? I love the look and am thinking of doing the same to mine. It was a kit Eileen. Brick a new, I believe it is in the post. Thanks.